This specimen was collected from Cundinamarca, Colombia. 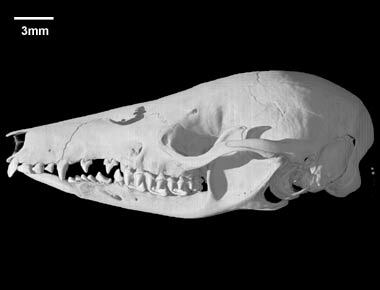 It was made available to The University of Texas High-Resolution X-ray CT Facility for scanning by Dr. Ted Macrini of the American Museum of Natural History. Funding for scanning was provided by a National Science Foundation Dissertation Improvement Grant (DEB-0309369) to Dr. Macrini. Funding for image processing was provided by a National Science Foundation Digital Libraries Initiative grant to Dr. Timothy Rowe of The University of Texas at Austin. This specimen was scanned by Matthew Colbert on 18 March 2005 along the coronal axis for a total of 946 slices. Each 1024x1024 pixel slice is 0.03 mm thick, with an interslice spacing of 0.03 mm and a field of reconstruction of 14.3 mm. To cite this page: Dr. Ted Macrini, 2007, "Caenolestes fuliginosus" (On-line), Digital Morphology. Accessed April 25, 2019 at http://digimorph.org/specimens/Caenolestes_fuliginosus/.